Drilling speeds are recommended not to exceed 800 rpms. All drilling and tapping procedures should be performed using copious amounts of external irrigation. Do not apply lateral pressure during drilling and tapping procedures. Select the appropriate Step Drill to continue the osteotomy. Apply light pressure along the long axis of the desired implant site. Drill all the way down to the drill-stop. 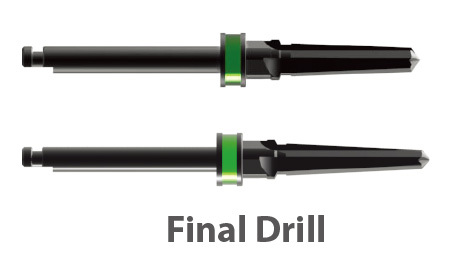 The drill is stepped and self-centering, which allows for easy cutting site preparation. Select the appropriate Final Drill to continue the osteotomy. Apply a light pressure along the long axis of the desired implant site. Drill all the way down to the drill-stop. 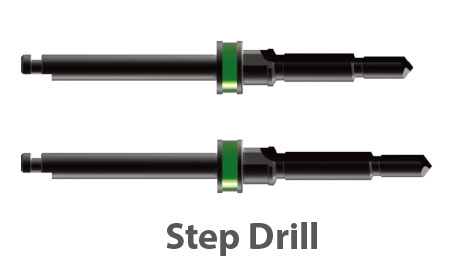 This drill is side-cutting and is used for shaping the site.